A study showed that labeling foods as red, yellow and green helped people make healthier choices. Looking for a colorful way to implement your New Year’s weight management goal? 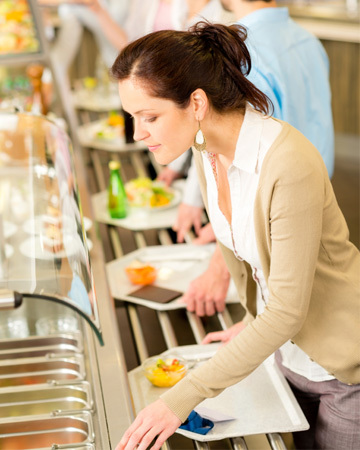 People at a Boston hospital found success choosing healthier foods in the cafeteria based on a labeling system. Foods were labeled with green, yellow and red labels, which denoted their nutrition content. Results from the two-year study appear in the current issue of the American Journal of Preventive Medicine. Not only did people make smarter choices when they chose green- and yellow-labeled foods over red-labeled items, but they kept up with better eating choices. The cafeteria also redesigned the cafeteria to display healthier choices at eye level. During the study, items with green labels sold at a 12 percent higher rate compared to before the program. Sales of items labeled in red dropped 20 percent. Unhealthy beverage sales dropped 39 percent. “The next steps will be to develop even more effective ways to promote healthy choices through the food-service environment and translate these strategies to other worksite, institutional or retail settings,” Thorndike said. Want to emulate those results at home? Start in your kitchen — namely in the refrigerator. Who knows, maybe all those red-and-green sticky notes can help you manage your weight.